Transparency International Hungary is starting to build a new, committed, young audience, who is ready to listen and take action against corruption. This community aims to provide a platform for those concerned with and willing to fight against corruption. Anyone who values transparency and is not willing to idly watch abuse of power or corruption can join. We wanted to have an effect on the younger generation, because we believe that raising awareness for a corruption-free society should begin with them. First, we conducted a survey on young people’s opinions about corruption. Most of the interviewees (aged 15-29) think young people should play a prominent role in the fight against corruption and want to change the prevailing opinion that fraud and bribery are concomitants. 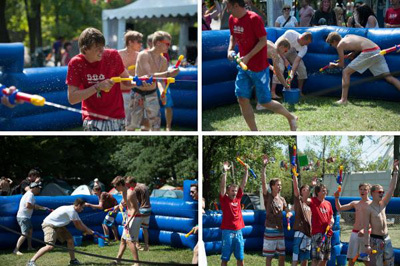 As part of the ‘Time To Wake Up’ campaign (with its images of corrupt people being splashed in the face with water) we launched the “The Big Splash” – waterfights at youth festivals throughout the summer. It was not only an excellent way to cool off on a hot summer’s day, it also communicated clearly: it is time to wake up! Transparency International Hungary and Kitchen Budapest organised a 24 hour Hackathon against corruption in October in the framework of a global event by Transparency International and Random Hacks of Kindness (RHoK) to promote innovative ICT solutions in the fight against corruption. 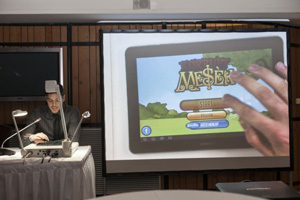 In addition, we launched a mobile app contest in November. The award ceremony was held during the Anti-Corruption Festival on the 2012 International Anti-Corruption Day. Beyond the theoretical solutions, we want to introduce practical tools. Our Anti-Corruption Festival 2012 focused on how technology can make state actors more accountable and help young people fight corruption. 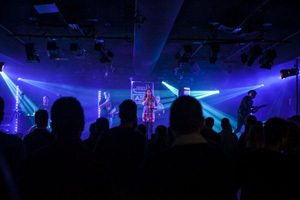 The festival included a conference and a concert by Balkan Fanatik, all of which took place aboard an A38 ship. During the mobile app competition we invited young designers and developers to produce applications to help young people connect with anti-corruption issues as, for instance, a game which emphasises the importance of the fight against corruption. Our aim was to find user friendly solutions for everyday life. The winners of the competition received cash prizes sponsored by the Dutch Embassy. As a part of the Anti-Corruption Festival, Telenor – a member of our Corporate Supporters Forum – opened Transparent Labyrinth at a well-known shopping mall in Budapest. Those visiting the “Átláccó” Labyrinth could learn about the threats of corruption in a playful, interactive way. While walking through the transparent maze, they had to make decisions in common corruption situations. Visitors making the right choices would find their way out of the labyrinth. We hope that these activities emphasised our message: it is time to wake up and act against corruption!